Isabella and Minnea are at the Shift 2017 conference in Tenerife, Spain presenting their research topics (conference WWW). The conference and its name are referring to spectral shaping of light and the topics range from applications in energy and photochemistry to biomedical applications. Go check the “Yb,Er up-conversion luminescence from molecular hybrid thin films prepared by ALD/MLD” poster by Minnea and “The use of synthetic hackmanites in storing UV radiation and X-rays” poster by Isabella. Minnea is attending International Conference on Hybrid and Organic Photovoltaics (HOPV16) in Swansea, UK on 28.6.-1.7. with a poster from our collaboration with Materials chemistry group about manufacturing Perovskite materials with ultrasonic spray method. You can spot us in two conferences next week. Emilia and Tero are participating in the 1st Conference and Spring School on Properties, Design and Applications of Upconverting Nanomaterials (UPCON) in Wroclaw, Poland on 23-27.5. with the topics “Sensitising Up-Conversion Materials with Layer-by-Layer Method” and “Extensive Study of NaYF4:Yb3+,R3+ Up-Conversion Luminescence Materials”. Come see their posters on Tuesday. Mika is participating in Biosensors 2016 in Gothenburg, Sweden on 25-27.5. and will be presenting his topic “Using Synthetic Hackmanites as Sensors of Solar UV radiation” on Friday afternoon so go check him there! 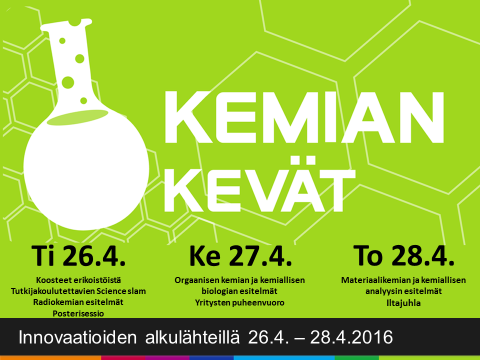 “Kemian kevät ’16 – Innovaatioiden alkulähteillä” which is a seminar event where BSc and MSc students present their thesis topics is held in Arcanum on 26.-28.4.2016. This year also PhD students give a brief introduction about their research topics. Inorganic materials chemistry has plenary lection on Thursday afternoon when our students will have their presentations – also as an added bonus Emilia and Minnea will have their Science Slam presentations on Tuesday. You can find the program and from the Kemian kevät website below. MatSurf 9th Annual Seminar 9.11. The 9th Annual MatSurf Seminar is held 9.11.2015 in Deparment of Physics and Astronomy, Quantum Auditorium from 9.00 forward. 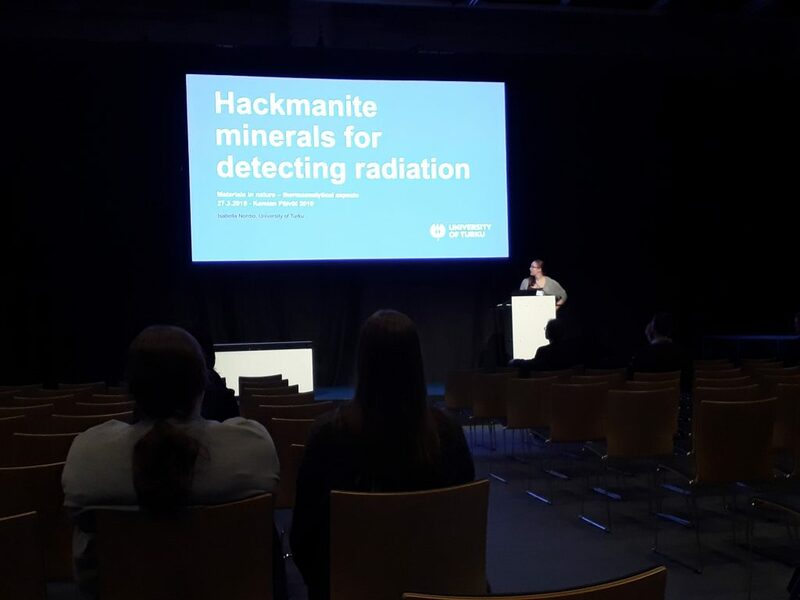 We’re attending the seminar with a presentation of Hellen “Luminescent Non-Doped Laponites: Anionic Layered Nanosilicates” and also contribute to poster session starting at 15.20. MatSurf stands for Turku University Centre for Materials and Surfaces and is a joint project of several research groups to make the most of the know-how and instruments in the field of Materials Research in Turku, Finland. We’re attending the 9th International Conference on Luminescent Detectors and Transformers of Ionizing Radiation in Tartu, Estonia on September 20-25. We’re attending the 9th international conference on f-elements is held in Oxford, UK on September 6-9. Come see our posters on Tuesday poster session with numbers #44 and #120.